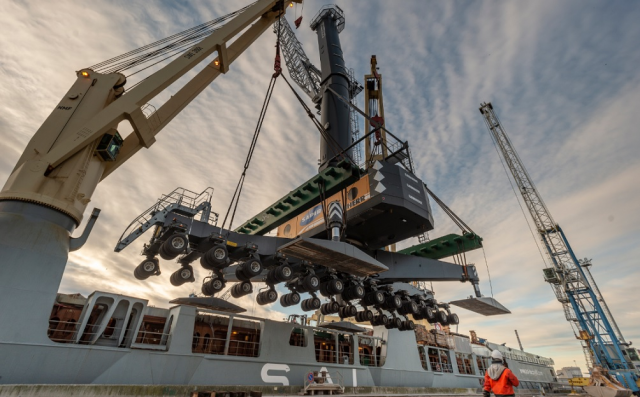 Recently, two new cranes were unloaded at the port of Ravenna ( see video below ), coming from Rostock in Germany, reinforcing the lifting equipment of the Sapir Group, with particular reference to the handling of ferrous materials and pieces of exceptional weight and size. It is a Liebherr 600 for Sapir and a Liebherr 550 for Terminal Nord, which, together with two 23 cubic meters buckets, are part of a total investment of 7 million euros. The economic commitment sustained by the Group in the last five years is thus close to the 50 million euro to strengthen the equipment of the terminals and the functionality of the handling and storage areas at their service. The new vehicle purchased by SAPIR is added to an identical one, already operating in the Darsena San Vitale terminal for a couple of years: 208 tons of capacity, a reach of 58 meters, a cabin 30 meters high, five more than the standard, ecosoftware that allows a reduction in consumption up to 50%. Sapir is now able, by operating with a combined crane, to lift pieces over 400 tons of weight. Numbers that place the terminal at the summit in the Adriatic for the ability to handle special pieces, also thanks to the large equipped aprons that offer the possibility of proceeding on site to the execution of shipbuilding activities and the assembly of components intended for boarding. A potential that can be spent, above all, for the embarkation of a large industrial plant destined for export and available among other things in the offshore district, another excellence of the Ravenna economy. "This is not a very significant percentage of traffic on the volumes of the group, but of great added value and we believe it will have a strong development with the realization of the" Ravenna Port Hub "project - explains Mauro Pepoli, Sapir's managing director and president of the North Terminal. In other ports of the Adriatic, the handling of pieces of exceptional weight and size requires the use of ships equipped with on-board lifting means. In our terminals, thanks to the professionalism and experience gained in the sector by our technical and operational staff, we are able to provide the service in total autonomy, offering a valid alternative to heavy lift vessels, which are difficult to find and have high costs " . For Sapir, a slightly growing year, with a particularly promising tip on ferrous metals, the implementation of new vehicles can be a good way for 2019, which should see, according to the auspices, the first work to strengthen the port channel.